These baths were situated in Via delle Terme at the the very centre of Pompeii, in the building opposite the Temple of Fortuna Augusta. They were built in the first year of the founding of the colony with public funds and were always assiduously frequented by the town authorities. The damage suffered during the earthquake was immediately repaired, and they were in fact the only baths in use at the moment of the eruption in 79 A.D.. Although by no means a large establishment, the Forum bath were nevertheless equipped with all the bathing facilities that a Roman citizen could desire. It were subdivided into men’s and woman’s section, each with their own independent entrance. There were three doors leading to the men’s bath on the street around the building, but we cannot be sure which were entrance and which were exits. The narrow corridor opening onto Via delle Terme led straight into the changing room and the entrances on Via del Foro and Vicolo delle Terme passed through a porticoed courtyard before reached the changing room. The changing room (apodyterium) was provided with wooden wardrobes in which customers could leave their clothes and stone benches along the walls. It had a barrel vault roof with a skylight in one of the lunettes, and both the walls and the vaults were embellished with stucco decorations on a yellow background, of which only a few traces now remain. 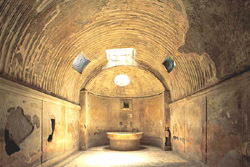 The first chamber was the frigidarium where customers could take a cold bath. It is a square shaped room lit by an opening in the vault, with apsidal niches in the corners and a round bath with the steps in the centre of the room. The changing room had another door leading into the tepidarium where customers could take a warm bath with water heated by a bronze brazier. This bathing chamber had a barrel vault ceiling while its walls were elegantly embellished with stucco work placed on either side of giants holding up a shelf. Lastly came the calidarium with its hot water bath and, on the far wall, a marble labrum, a bath with cold water for guests who needed to cool off. The temperature in the room was maintained by the circulation of warm air in a cavity between the walls and lining a breast-shaped tiles. The women’s bath were laid out in a similar way on the other side of the boiler room, which was used by both sections and could be reached from the entrance on Via delle Terme.